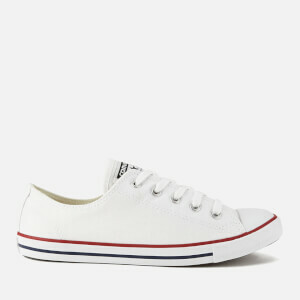 Converse Chuck Taylor All Star Hi-Top Trainers with a white canvas upper and tonal white midsole. The classic trainers feature the iconic All Star logo on the inside of the shoe and a red and black striped midsole. Finished with metal eyelets, rubber toe cap and All Star heel branding. - A.D.